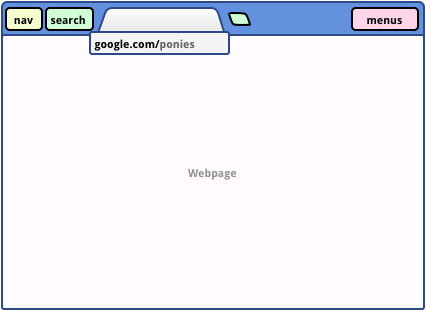 Will You Miss The Browser Address Bar If Google Kills It? Say goodbye to your address bar… maybe. Google is mulling over replacing the address bar found in its Chrome Web browser with something less intrusive (if that’s the word to use). In one scenario, the address bar would only become visible when, say, the mouse pointer is hovered over a certain area of the screen. At all other times the address bar would vanish from the interface. The (possible) changes come soon after the release of the latest Internet Explorer 9 beta (technically it’s a release candidate at this point). Mozilla may hate the browser, but the interface is the most “radical” of the bunch. For starters the tab bar and the address bar are on the same Y axis, which Microsoft says helps sites “shine.” (You always get the feeling that Microsoft tries too hard when it comes to verbiage.) Obviously what Internet Explorer does is irrelevant to the Mac and Linux users in the audience, be it serves as an example of where modern browser design may be going. Back to Chrome. Google’s working on four different interfaces: classic, compact (seen above), sidetab and touch. Classic is what you currently find in Chrome, compact is what we’re discussing here (vanishing address bar), sidetab places search and navigation controls on a sidebar leaving the main viewing window for the site itself, and touch is for touchscreens. The compact design resembles IE9’s interface in that all navigation elements are on the same Y axis. The difference is that Chrome’s address bar would only appear when needed. That could leave the browser more vulnerable to phishing-style attacks: it’s hard to tell if you’re actually on ebay.com or ebay.ksbgkwgbe.com if the address bar goes away as soon as you land on the site. Needless to say, such a change would take a little while to get used to, particularly if you browse the Web on a large enough monitor where you’re not fussing over vertical space. Then again, I seem to recall a similar unease when Firefox first introduced the “awesome bar,” and we all got used to that, right? Or is this a case of minimalism for the sake of it? When did it become so bad to have a few buttons up there?